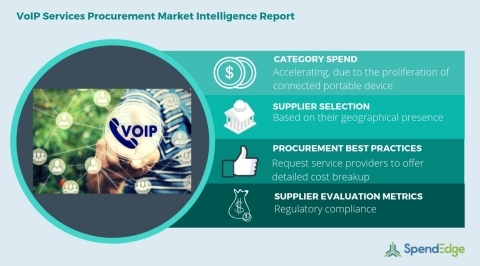 LONDON--(BUSINESS WIRE)--SpendEdge, a global procurement market intelligence firm, has announced the release of their Global VoIP Services Category - Procurement Market Intelligence Report. Improving internet connectivity is increasing penetration of portable Internet-enabled devices such as laptops, smartphones, and tablets that are creating substantial demand for VoIP services. Advantages such as conducting integrated meetings with different stakeholders across the world, as VoIP services allow sending different media during a conversation are favoring the category adoption across various business sectors. However, the growing instances of cyber attacks are impeding the category growth to a major extent. Request your free sample copy of this VoIP services market intelligence report here! The thriving e-commerce industry is accounting for a higher category adoption rate in the US. Buyers from this industry are leveraging VoIP services to boost their customer relationships and realize their cost-saving goals. Declining mobile tariff rates coupled with the proliferation of Internet-enabled devices will favor the category adoption rate in APAC. In countries that are members of OCED, SMEs are exhibiting a rapid rate of adoption of VoIP services to reduce telecommunication costs and a decrease in investments in hardware. This VoIP service sourcing and procurement report offer a scrupulous analysis of the supply market forecasts that include supply selection criteria and negotiation strategies of top suppliers and buyers. Also, it also provides information on the total cost of ownership outlook and pricing strategies to cut down on costs. Ask for a customized version of this VoIP services market intelligence report here for free. “It is advised that buyers request service providers to offer a detailed breakup of the cost structure of the services,” says SpendEdge procurement expert Tridib Bora. “Visibility if the cost-structure of the services can aid buyers to devise their pricing strategies that can identify avenues to save costs,” added Tridib. Buy the complete VoIP services market intelligence report here to explore its complete scope of coverage. SpendEdge’s procurement market intelligence reports for the information technology category offer information on critical cost drivers and category pricing strategies to help the buyers achieve significant cost-savings. The report provides information on supplier selection criteria to help buyers reduce spend and establish better SLAs. Additionally, SpendEdge’s reports offer category management insights and procurement best practices for the category. Do you purchase multiple reports in a year? Our subscription platform, SpendEdge Insights, provides ready-to-use procurement research reports for multiple categories. Now access latest supplier news, innovation landscape, markets insights, supply market forecasts, and much more at the click of a button. Start your 7-day FREE trial now.